For the nuno wrap/mini skirt I decided to lay out my fibre on top of the ‘right side’ of my fabric, because of the obvious semicircular shape and due to the fact that it had been lining from one of my skirts it actually had loads of seams all around the inside. For the bulk of the fibre I used a hot pink merino and then added small circles and a few strips in either apple green or orange. The fabric that I embellished with was torn strips of the silk/cotton mix and I also added some loose silk fibres to the surface. 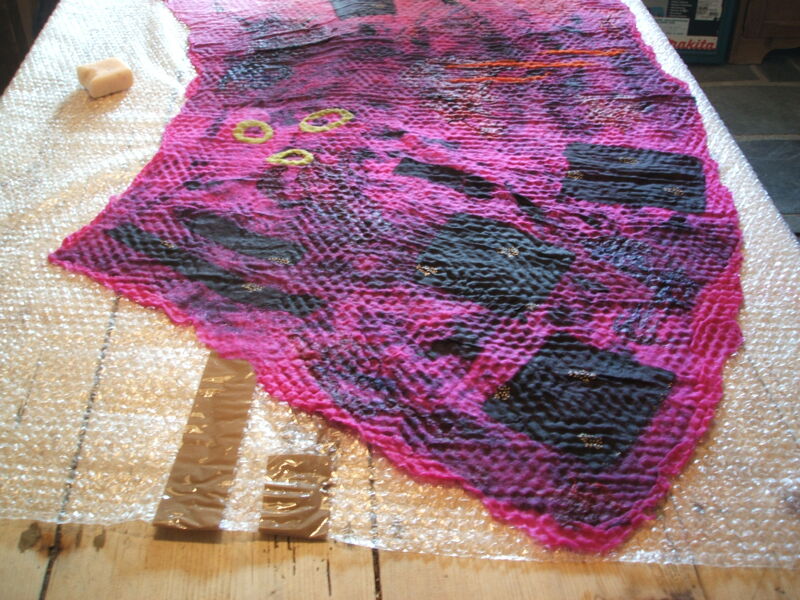 Once the fibres were laid out and wet I covered them with a second piece of bubble wrap and rubbed and rolled as normal. Because this was a nuno project I started the felting process using cool water and soap, if I had used hot water the thin covering of wool fibres might have felted quickly and not migrated through the backing lining fabric at all. Rolling was more difficult than normal, the shape made the wrapped felt want to go off in all sorts of directions rather than just rolling straight down my kitchen table! Surprisingly quickly the fibres migrated through the lining fabric. I did need to rub directly on top of the embellished wool for a bit and this enabled the fibre to migrate through the tightly woven silk/cotton pieces in the top layer as well. I love the texture of the finished piece but my favourite aspect of the whole project has to be how the seams from the underside become a quirky feature when the piece is worn with the fabric side out! If you check out my Flickr photos you can see some more shots of the various way this piece may be worn, nuno really is a brilliant technique and I look forward very much to sharing the process with participants at my workshop on Saturday 23rd January. This entry was posted in Felt, nuno felt, workshops and tagged cotton, Fabric, Felt, Felting, fibre, mini skirt, Nuno, nuno felt, nuno felt mini skirt, nuno felt wrap, nuno felting, nuno wrap, silk, wet felt, wet felting, wool merino, workshops by Nicola. Bookmark the permalink. 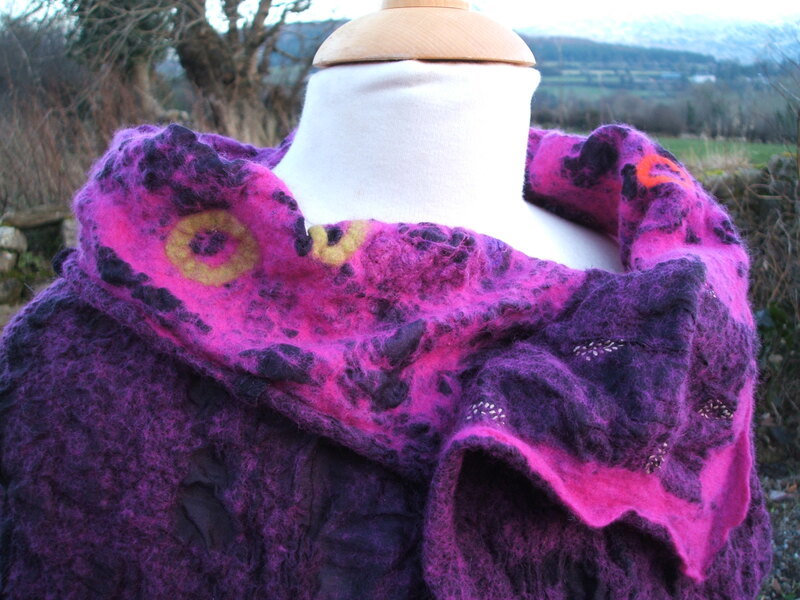 This is totally sumptuous, rich in texture, which we all love as textile creators……….amazing what you have created.